Happy Day After Easter! He is Risen Indeed! I should back up a tad though. To prepare for it all, I had a lot of fun this year decorating and getting the house ready. I like to keep things simple and sweet… but it doesn’t come naturally. I take forever fiddling and thinking through things to get it just right (or close enough). I think I may have drove my family a little crazy with all my home decor projects! 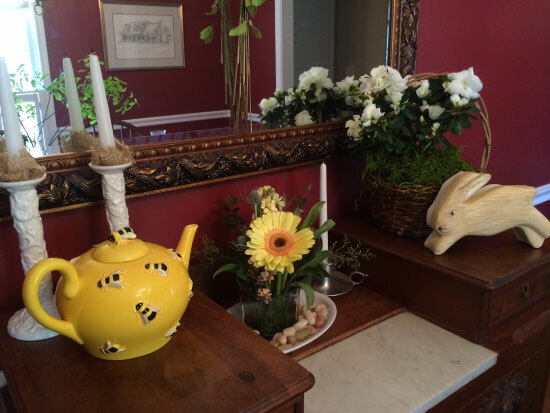 Here is an Easter garden I created… but this one doesn’t have any dirt so I can store it for next year! I just used a little moss instead. Celebrating the death and resurrection of Jesus is the most important part of Easter for our family and I just really wanted a decoration that reminded us of this! This wreath that’s now hanging in my kitchen was a very simple creation… I just took a store bought wreath and added little Easter eggs. My husband and I made some big diet changes on January 1st of this year and it’s been such a success that we’re sticking to it! So the macaroni and cheese dish and a few others like it, got cut from the line up. Of course, not everyone in the family is eating like us so Uncle Jon brought over some yummy bread (that I must admit I ate a tiny piece of). 🙂 I’m not a chef but I found a simple healthy recipe for asparagus risotto that I thought I’d try. As I began putting it together Aunt Chris and Uncle Jon (who are very good Italian cooks) kept commenting on how they’ve never made risotto because they heard its quite tricky. My “simple little recipe” quickly changed to an intimidating one as 13 people hovered in the kitchen waiting to eat. Yikes! But in the end it turned out ok. Whew!! 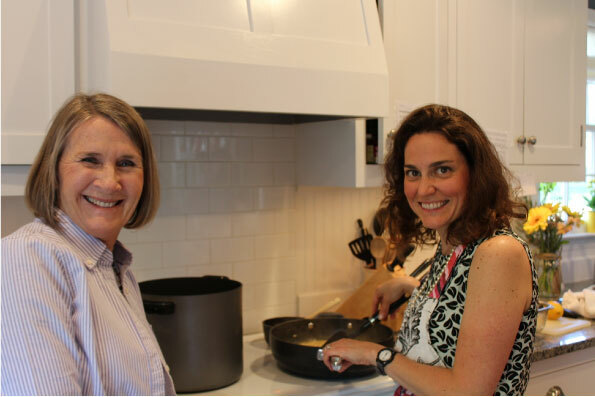 Here’s a picture of me and my sweet mother-in-law as I stir stir my risotto (I quickly learned that lots of stirring was required). We finished the afternoon off with my mother-in-law’s beautiful 3 layer lemon cake that was amazing! (Did I just admit to eating that too?) Also, my 10 year old daughter created a scavenger/egg hunt for the older cousins who are in high school and college. It was a hoot watching the older ones running around instead of the younger ones this year! Family Easter pictures are a must. This tradition dates back quite sometime for my family. 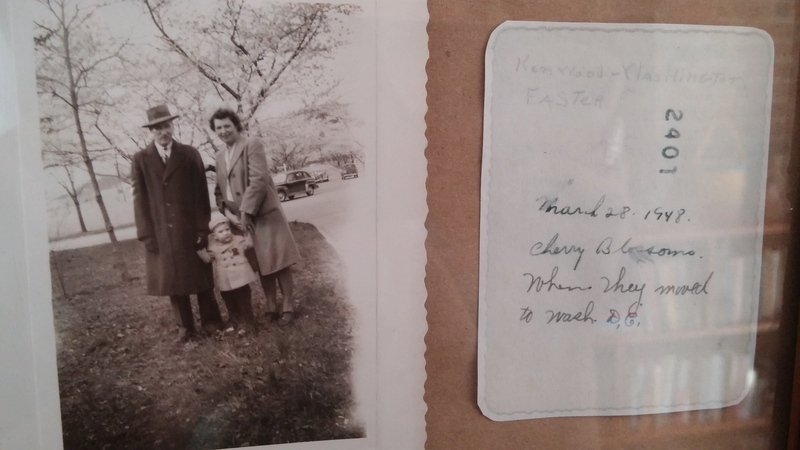 This is a photo of my grandparents and my father on Easter Sunday, March 28, 1948 in Washington DC taken with the national cherry blossoms as their backdrop. We don’t have very many photos of them so we think its kinda neat that this event and Corban’s birthday were both on March 28th! Now, sixty six years later here is a photo me and my sweet family on Easter 2014. Not every day is heavenly but I’m thrilled to say this one was pretty close! As a parent I think we can agree we are all looking for Winter Activities for Kids that will engage our children while providing something fun for the whole family and maybe even a little educational for the kids. I can almost guarantee there are a million and one posts about sledding , ice skating or roasting marshmallows over a fire. Those things are fun and to be honest should be a part of every child’s life; not just once, but on a regular basis. I would suggest finding things to do that go beyond the normal scope of everyday winter activities for the kids. One of the things that will help determine what to do with your kids on any given fall day is the weather. Winter brings uncertainty when it comes to the weather. You can have a beautiful, sunny day followed by a snowy day. Or if you life in the south weather might not be an issue. Here are a few ideas of things to do on different sorts of day. On a day when the weather doesn’t agree with outdoor activities look for a museum to visit. It doesn’t really matter where you live it is almost guaranteed there will be a museum in the vicinity. The trick is finding the one that will provide entertainment for the kids. Most large cities, and even a fair share of smaller cities, have a children’s museum or a something of the sort that is geared towards children. If the winter weather is agreeable it can prove a great time to visit a historical site. Places like Plymouth Plantation or Jamestown can provide a wonderful interactive experience for the kids. Look for a fort to visit if the weather is nice. I was surprised to find an incredible number of forts throughout the US that are open to the public on a daily basis. Ranging from Colonial forts to World War II forts, there is a wonderful array of exciting places to visit. The best part of visiting historical sites like these is that they allow the whole family to engage history on a person, interactive level. I remember as a young kid the thrill of being able to run around old forts; climbing the battlements and pretending I was a Colonial defender. The memories have helped foster a love of history that follows me to this day. My last suggestion would be to take in a sports game. There are some great sports taking place in the fall and winter; soccer, football, hockey, and later in the season some basketball and volleyball. If you feel inclined you can fairly easily find a team in any of the major sports. If you are like me, however, more affordable is better. In this category fits you I would suggest finding a local college team to follow. Tickets will tend to be free or very inexpensive and will allow your children to watch a competitive sporting even. If you want to find something in the middle there are many more semi-pro teams for every sport that will have tickets for under $20. These are just a few of the things that are available for families to do in the winter. One of the best things in my opinion is to find something new to broaden the horizons of your children. The best thing to do is have fun with your kids and enjoy their enthusiasm. Cherish every moment you have with them. Brown paper bags are all you need to get started on great children’s crafts for Thanksgiving celebrating Native American culture. These are some ideas to get you started. Collect big brown paper bags while you’re doing your shopping at grocery and liquor stores or buy them online. Put together a variety of objects for decorations like buttons, beads, feathers, yarn and leather shoelaces. Then all you need is scissors, glue, magic markers and crayons. You can make paper bags look like leather by soaking them in the sink or a large bowl of warm water for about ten minutes. Adding a cup of brown tempera paint will make the bag look more like cloth. Simple crafts include shields, vests, scrolls and blankets. For a shield, separate two bags along the seams and glue them together and cut out a circle shape. Vests can be fashioned by cutting a neck hole in the bottom of one bag with arm holes on the sides. For scrolls, cut out a rectangle and roll the edges around a stick on each side and glue them in place. A big bag or a roll of brown paper makes an easy blanket style tablecloth. Decorate your crafts with animal shapes or geometric designs. Cut the edges to make fringe. You can use the crafts for a separate party or let kids show them off at their own table on Thanksgiving Day. With so many different Native American tribes, there is no single authentic cuisine. Most kids will love a menu that draws on the Mesoamerican traditions behind today’s Mexican food. They’ll gain a new appreciation for the tortillas they already love, and they’ll be more likely to eat their vegetables. The kids table will look like the best seats in the house when you help the little ones design it themselves. Enter into the true spirit of Thanksgiving by remembering Native American culture and sharing activities with your loved ones. Invite all your family and friends over for Thanksgiving Day with this great invitation. With all the details displayed wonderfully on this Thanksgiving inspired invitation, everyone will be on time! Visit http://www.amyadele.com/ to personalize yours today! Nanny in the Clouds is a hiring service that gives parents peace of mind and helps you keep track of your kids before, during and after your trip home to see the parents. Call the service and it will connect you with a nanny who happens to be on your same flight, or it will arrange for one to meet you curbside to help you herd your family from plane to rental car to hotel. But what if you drive? No matter how you plan to get to grandma’s house, exercise several tips as you keep your kids safe. It’s not a musical instrument, but your vehicle’s thousands of parts need to work in harmony if you’re going to get your kids to grandma’s house safely. Spend a morning in your home garage or at the mechanic’s and tune up the car. Check the tire pressure, brakes and battery. You’ll also want to top off the fluids, replace worn windshield wipers and make sure the lights work properly. Make sure the child seats and belts work properly so that your children can stay securely and properly buckled in at all times. A laptop, iPod or smartphone works wonders to keep your little ones entertained in the back seat so that you don’t hear your kids whine about the long drive and their annoying siblings. The American Academy of Pediatrics reports, that laptop-induced “erythema ab igne,” which is pigmented skin caused by the heat from electronic devices. A laptop case provides a protective cushion as your children watch movies and play games during the long ride. Likewise, volume over 110 decibels causes hearing loss, according to the University of Leicester, so give your kids headphones or ear buds with adjustable volume controls as they listen to their favorite movies or tunes. 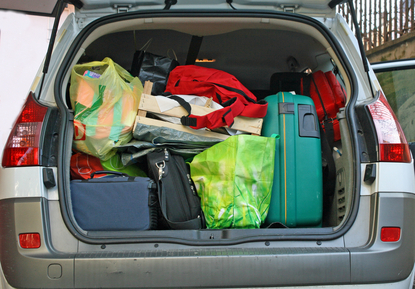 While AAA reports that 90 percent of holiday travelers drive to their destinations, your family might need to fly to grandma’s house. Safety precautions in the airport start with securing your documents. Keep your children’s tickets, IDs and passports safe in your inside jacket pocket or fanny pack as your hands stay free to corral your energetic offspring. For even greater peace of mind, invest in protection services that secure your family’s identities if your personal documents are stolen or lost as you travel. Next, keep tabs on your kids before and during your flight. If Nanny in the Clouds isn’t an option, a child leash or Kangakid that serves as both a child carrier and a bag ensures your active little ones stay safely near you before your flight. On the plane, secure your kids in their seat belts or in an approved child protective system. Likewise, sit your kids away from the aisle to prevent them from reaching out for hot beverages or silverware on the food carts. The carry-on bags your kids bring serve as an important safety measure. In them, pack essential prescription medicines and over-the-counter pain reliever and antacid. Remember the diapers, food and empty water bottle too. Your kids also need plenty of activities and safe toys that aren’t sharp, hard or heavy. With these objects, they stay occupied and safe on the flight to your holiday destination. Autumn is upon us bringing cooler days, colorful foliage and one of our favorite holidays; Thanksgiving. Giving thanks for our family and friends, as well as for our bountiful blessings, is what the celebration is all about. But face it, Thanksgiving without a table overflowing with delicious recipes wouldn’t be the same. If you are new to preparing this special meal, or would like to change things up a bit with new recipes, try one ore more of these especially tempting Thanksgiving Recipes. Preheat oven to 400˚ F and cover a baking sheet with parchment paper or foil. Peel, seed and chop the butternut squash, onions and sweet potatoes into 1 inch chunks and place them in a large bowl. Combine rosemary, salt, pepper and sugar in a small bowl. Coat vegetables with the olive oil and then sprinkle with rosemary seasoning mixture. Toss to fully cover vegetables. Spread the seasoned veggies in a single layer on the baking sheet and bake for 30 to 40 minutes, or until fork tender. Crumble cooked cornbread in extra-large mixing bowl. Place stuffing inside and around turkey in roasting bag and cook as per directions for turkey. For stuffing cooked outside of turkey, place in large casserole, cover with foil and cook at 350˚ for 45 minutes. Remove foil and bake an additional 15 minutes. Prepare 3 of your favorite bottom crust only pie crusts or purchase 3 – pre-made pie crusts. Mix whiskey, pumpkin, sugar, nutmeg, egg yolks, butter and milk. Beat egg whites until stiff. Fold into pumpkin mixture. Pour into uncooked pie shells and bake at 425˚ F for 15 minutes. Reduce to 350˚F and bake for 45 to 60 minutes, or until knife blade comes out clean. Place oven rack in top 1/3 of the oven and preheat to 500˚ F.
Cook butter on low in a medium skillet until it turns golden brown, about 3 to 4 minutes. Remove from heat and stir in the brown sugar, five-spice, salt and ¼ cup of water. Cook over medium-low heat until the ingredients are melted and combined; about 3 minutes. Using a fork, poke the squash and then dip each slice into the brown sugar glaze until coated. Place glazed squash, cut side down, on a parchment covered baking sheet and roast for 12 minutes. Remove squash from the oven, turn each slice over and bake until golden; about 7 to 10 minutes. These recipes are sure to shock and awe your family and friends! Preparing and partaking a recipe in a mouthwatering meal is paramount on Thanksgiving, but remember to give thanks, and take the time to enjoy the special day with those you hold most dear and your favorite recipes. To help keep track of all of your new favorite Thanksgiving recipes, use one of Amy Adele’s recipe cards! With a variety of designs, you’ll be happy to write down your favorite recipes and give it to a friend or a gift to your self for all of your hard work! From the fiery kaleidoscope of the leaves to the plumpness of pumpkins and ruby red of apples, fall’s natural beauty pervades the whole outdoors. Why not invite it indoors with you? There are many ways to include nature in your autumn decorations. Here are a few fall decoration ideas that are fun to make and will bring a warm feeling to the chill fall evenings. Corn husk candles. Wrap a large candle in corn husks and tie with strips of husk or colorful ribbon. Enjoy the glow of the fall harvest in your living room. Hanging gourd vase. Dry a swan gourd and cut a large hole in the upper portion of the bulb. Use as a vase for dried or freshly cut flowers, or even as a planter for live ones. Foliage arrangement. Use dry, colored leaves, fall flowers and the fluff of seeding plants to create a beautiful bouquet. Place anywhere–on the table, in the bathroom, or on the bookshelf are good options. Pumpkins. Beautiful on their own, pumpkins can also be carved with beautiful patterns. 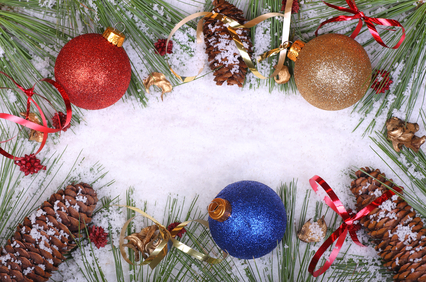 To make longer lasting decorations, don’t cut the whole way through–just etch a design on the surface. Pomanders. Oranges can studded with cloves to make beautiful decorative designs. They smell amazing and can be eaten or made into juice afterwords. Crafty leaves. Glue leaves to craft paper and attach colorful string or fishing line to make a mobile. You can also use the cards to decorate window sills, or use double sided tape to decorate the walls. Harvest corn basket. Peel back he dried husks of colorful corn and arrange into a colorful basket. Mix with other fall bounty to add color and diversity. A Wreath. a gorgeous addition to an entry way or door, a wreath is surprisingly easy to make. Use all sorts of natural fall materials to create the perfect one for you. Making these crafts is especially fun to do with the family. Try involving the kids–go on a nature hike and pick out the most beautiful of nature’s creations to use in your art, and each create your own decorations. Happy crafting! Halloween with your child can be one of the most fun times of the year. From pumpkin carving to trick-or-treating, the holiday is full of enjoyable opportunities for a great time with the kids. Going to the local department store and picking out a costume is fine, but you miss out on an exciting activity with your child. Plus, have you ever looked at a Halloween costume thinking that you could have made something better for a tenth of the price? Making your child’s Halloween costume together is an opportunity for your children to learn valuable skills, have fun with their mom or dad, and will give them a sense of pride when they wear it on the big day. Here are some easy Halloween costume ideas that are fun and simple to make. A mummy Halloween costume takes little more than some light colored, tight fitting clothes (try PJs), and a few rolls of gauze. Use glue to make a permanent costume, or wrap it on the day of. Be ready for giggles as you begin to wrap! A bat costume can be made by detaching the head of an umbrella and cutting it in half (be sure there are no sharp edges), making wings (black cloth can also be used). Sew these to the back of a plain black sweatshirt, and cut ears out of black felt. Make a mask by cutting a piece of construction paper and gluing it to sunglasses. An artist costume is easy to make. Cut a paint pallet out of cardboard and paint splotches of different colors onto it. A brush to hold and a bandana to wear are the only other essentials, but it might be fun to think creatively about which clothes would represent an artistic personality. A great follow up activity is painting! A flower costume can be made using an all green outfit topped with felt petals. With some safety scissors and a chalk line (depending on his or her age), your child can cut he petals his/herself.Face paint is optional. A simple knight costume can be created with a base of grey sweatpants and a grey hooded sweatshirt. An art smock or vest (worn backwards) can be adorned with a painted or sewn emblem, designed by your child. Tuck the pants into high boots (snow boots should work fine) and there’s just one more step. A sword can be made from wood or cardboard, using a saw or scissors to cut a blunt tip and attaching a small piece of the material at the base as the hilt, or cross-guard. Use silver spray paint to give it a realistic sheen. A shield can be cut out of cardboard and decorated by your child (use string to make a handle to slide the arm through). Make a Lego Halloween costume using by painting a cardboard box and cutting a home for your child’s head. Glue colored plastic bowls to the front to make it complete, and make sure the sweatpants and sweatshirt matches the color of the box. This list is just a start. Think creatively with you child and you are sure to come up with the perfect Halloween costume ideas to fit you both. Enjoy your crafting and happy Halloween! This spooky black spider is the perfect way to invite all of your friends over in their Halloween costume! Halloween will be here soon, and if you don’t have a costume yet it’s time to do some serious brainstorming. The best things about Halloween are dressing up and being with your friends and family; and it’s especially enjoyable to combine the two. If this year’s Halloween plans include a party or outing with others, consider one of these group costume ideas. Star Wars: Star Wars has created a fan base which spans generations, making it an ideal theme for family Halloween outfits. Mom and Dad make are perfect as Han and Leia, Darth Vader and Stormtrooper or Anakin and Padme while the little ones can dress as Chewbacca, Yoda, Ewoks, Stormtroopers or Jedi Knights. Farmers with farm animals: Trick-or-Treat with the cows and pigs this All Hallow’s Eve. Parents can dress-up as farmers with their young animals in tow, getting their treat bags filled with goodies. Alternatively, switch it around and have the kids dress as farmers while Mom and Dad transform into sheep, goats, horses or other barnyard friends. Monsters Inc.: Monster’s Inc. is hot right now so there is no shortage of ideas for dressing up like your favorite furry (or slimy) Monster’s character. While Sulley and Mike seem like the classic choice for Mom and Dad and Boo for their little girl, you might decide to mix it up a bit and don the kids in costumes like Mike, Sulley or any of the other loveable monsters from the cast while Mom and Dad dress as Roz and Mr. Waternoose, or from Monsters University, Don Carlton and Ms. Squibbles. Or dress the whole family in green “OK” shirts and hats and go as the Oozma Kappa clan. Toy Story: Toy Story is another classic animated film from which a multitude of entertaining costume inspirations has come. Buzz, Jessie, Woody, Mr. Potato Head and the rest are simple and fun attire for a Trick-or-Treating expedition or not-so-frightening family parties. Peanuts Gang: Young kids still love Snoopy and the Gang. The whole neighborhood will adore your little ones if they dress up as Peanuts characters for their Halloween “Tricks-or-Treats”; just hope no one gets a rock. Disney Princesses: Little girls still dream of being a princess. Their wish will be granted this Halloween when your daughter and her friends dress up as Cinderella, Snow White, Belle and their other favorite Disney Princesses. Pirates: Pirate costumes are perfect for boys and girls of all ages. Let your kids have a grand adventure this Halloween dressed as a crew of swashbuckling buccaneers. Multiple colors of Crayons: What a great group costume! The little ones will be especially excited to dress as their favorite Crayon shade. Be creative with colors; think the 64 Crayon box. Wizard of Oz: Dress the youngsters as the Tin Man, Cowardly Lion, Scarecrow, Dorothy and even Toto this Halloween in homage to this timeless family film. Getting your friends to dress up with you in a group costume will be a breeze, everyone knows and loves these costume ideas! Video Game Characters: From Pokémon to Angry Birds to the Mario Brothers, video game characters are cool and easily recognizable; making them fantastic options for Halloween attire. Alice in Wonderland: Spend this Halloween in Wonderland with your favorite players from this classic book and movie. 1950s: Groups of boys and girls, or men and women, can go to the Sock Hop in the characteristic style of the 50’s when they dress-up in leather jackets and poodle skirts. Zombies: Spooky costumes are the quintessential in All Hallow’s Eve attire, and Zombies are at the top of the list. Zombie costumes are simple to make or are easily found in Halloween stores and online. Super Heroes: Almost everyone wants to be like Superman, Batman, Spiderman or Wonder Woman. Hit the town with your crowd dressed as your favorite super heroes. Harry Potter: Ron, Harry, Hermione and the rest of the Harry Potter gang have been Halloween favorites for over a decade, and this year is no exception. This Halloween skip the same old boring costume. Become the center of attention when your friends, family and kids get together and dress in hilarious, witty, creepy or just plain fun group costume. Check out Amy Adele for great Halloween party invitations, labels, thank you notes and more! This invitation is perfect for inviting your friends to come dressed as whatever they’d like or as a group costume. Just remember to remind them what the group costume is!